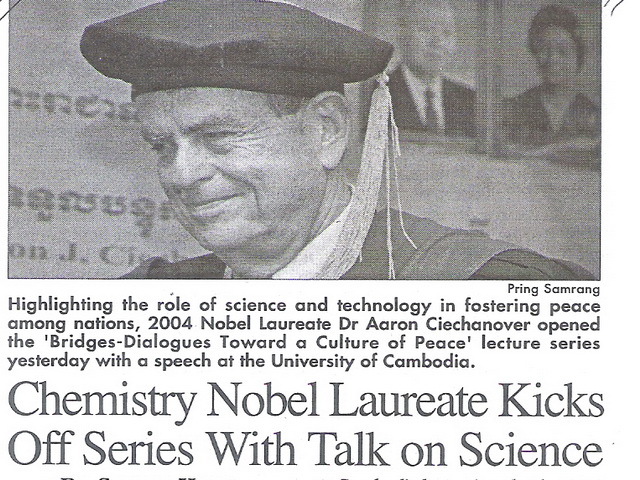 Health, prosperity and education have no political bias or ideologies, which make them perfect as foundations, said Nobel Laureate for Chemistry Dr Aaron Ciechanover during a lecture in Phnom Penh yesterday. Dr Ciechanover, who was awarded the Nobel Prize in 2004 for a discovery that helped researchers understand how a cell controls a number of functions by breaking down some proteins and not others, was the first speaker in the series "Bridges-Dialogues Towards a Culture of Peace." "A single bacteria, single virus, diseases exist whatever the language," he said to a standing-room only crowd that was composed of mainly students but included government officials, monks and other guests. "Wherever you go in the world you will find sick people." Dr Ciechanover used magazine covers and media coverage to show that science and medical innovation were important to the public, not just a handful of experts or researchers. "Science, technology and knowledge are the new drug for peace," he said. Dr Ciechanover also compared Cambodia to his country, Israel, in addition to making the case for science as a tool for peace. Both Cambodians and Jews suffered from a period of genocide and currently both Cambodia and Israel are small countries in conflict with other nations, he said. He then compared Cambodia and Thailand to Israel and Iran, although he added the current conflict in his country was more serious. "This is not about a temple or small piece of land... They want to wipe us out," he claimed of the Iranians. Cambodia has enjoyed at least 10 years of peace, but Israel has never been without conflict, he continued. He also said that Iranians were now using the medical technology he, their enemy, helped create to cure cancer in their country. Human resources were another thing both countries could someday have in common, Dr Ciechanover said, adding that Israel is able to export many specialized things including electronics, biological materials and medicines because of an investment in people. "In Israel, we don't have water or natural resources...but we do have one thing: human resources," he said. "We push education as far as we can." Looking at the crowd, Dr Ciechanover said the students there and in all of Cambodia would be the key to the country's prosperity. "What the country is investing in now is human resources," he said. University of Cambodia students Heng Chheng Ngaru and Ea Rehty, both 19, said they enjoyed learning about the similarities between the two countries but their favorite part of Dr Ciechanover's lecture was the discussion of advancements in medicine and chemistry. "The most important part was the new solutions he offered," Mr Chheng Ngaru said. Uwe Morawetz, chairman of the International Peace Foundation, said the lecture series will bring up to 50 speakers to Cambodia through April 2010 and the long-lasting nature of the event, instead of the organization's dedication to promote peace in the region. "Bridges' takes no sides, it acts as a mediator," he said. Other speakers scheduled to speak in Cambodia include actin film star Jackie Chan, 2004 Nobel Laureate for Physics David Gross, pianist and conductor Vladimir Ashekenazy and US filmmaker Oliver Stone.